Canadian physician mission specialist astronaut 1983-2012. Status: Inactive; Active 1983-2012. Born: 1953-08-17. Spaceflights: 2 . Total time in space: 204.77 days. Birth Place: New Westminister, British Columbia. Born August 17, 1953, in New Westminister, British Columbia. Married to Brenda Biasutti of Montreal, Quebec. They have two children. Dr. Thirsk enjoys spending time with his family as well as flying, squash, and playing the piano. Attended primary and secondary schools in British Columbia, Alberta, and Manitoba. Received a bachelor of science degree in mechanical engineering from the University of Calgary in 1976, a master of science degree in mechanical engineering from the Massachusetts Institute of Technology (MIT) in 1978, and a doctorate of medicine degree from McGill University in 1982. Member of the Association of Professional Engineers of Ontario, the Canadian College of Family Physicians, the Canadian Aeronautics and Space Institute, the Aerospace Medical Association, the Colleges of Physicians and Surgeons of Ontario and of British Columbia, and the Ontario Medical Association. He is also a Director of the Canadian Foundation for the International Space University. Won the Association of Professional Engineers, Geologists and Geophysicists of Alberta Gold Medal in 1976. First recipient of the University of Calgary Distinguished Alumni Award (1985). Dr. Thirsk did research in biomedical engineering during his years at MIT and McGill University. He was in the Family Medicine Residency Program at the Queen Elizabeth Hospital in Montreal when he was selected to begin astronaut training. 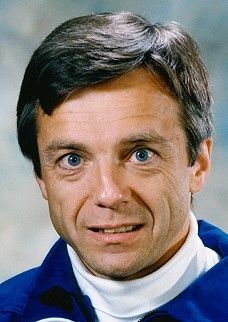 As one of the six Canadian astronauts selected in December 1983, Dr. Thirsk began astronaut training in February 1984. He served as back up Payload Specialist to Marc Garneau for Mission 41-G which flew October 5 to 13, 1984. Dr. Thirsk is currently co-leader of an international team investigating the effect of weightlessness on the body's venous system. He has designed an experimental "anti-gravity suit" that may help astronauts readapt more easily to life on Earth. Dr. Thirsk regularly participates in parabolic flight experiment campaigns on board NASA's KC-135 aircraft and has been involved in several Space Medicine, Space Station and mission planning working groups. He served as Chief Astronaut of the Canadian Space Agency in 1993 and 1994. In February 1994, he was Crew Commander for the Canadian Astronaut Program Space Unit Life Simulation (CAPSULS), a simulated 7-day space mission in which four Canadian astronauts participated. From September 1994 to March 1995, Dr. Thirsk undertook a program of specialized training in Victoria, British Columbia, designed to enhance his expertise as a crew member of an upcoming space mission. This included medical practice, research, and Russian language training. As an adjunct professor at the University of Victoria, he continues his research in space medicine. In April 1995, Dr. Thirsk was selected to participate in the Life and Microgravity Spacelab mission (STS-78), an international research mission scheduled for mid-1996 aboard Space Shuttle Columbia. He is currently in training at the Marshall and Johnson Space Flight Centers. Family: Astronaut. Country: Canada. Flights: STS-78, Soyuz TMA-6 Eneide, Soyuz TMA-15. Projects: STS. Agency: CSA. Bibliography: 12, 6098.